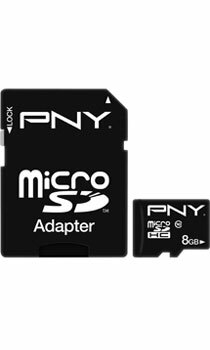 Enjoy faster data transfer with the PNY 8GB microSDHC Memory Card, featuring class 10 speed with a speed rating of 66x. Ideal for smartphones, tablet PCs, and other mobile devices. The Micro SD adapter ensures that this SD card is compatible with any device that has a mini or standard SD slot, so you'll be able to store or retrieve your information with ease.